Oh, and my daughter picked out the star this year. It looks like we have a disco in the room. Cue thumping music now. But as you see, it's an eclectic assortment of ornaments. There is not a large colorful string circling the tree because our cat would attack it and the whole thing would come crashing down. And then our cat would look at US like WE did it. Our tree wouldn't be considered a Pinterest tree, but each of these ornaments mean something. I've had these Bert and Ernie skating figures since I was like 5. And in the middle is my first Christmas ornament with my husband. Also, there are sometimes 3 ornaments on one branch, because when kids decorate, they don't always pay attention. But it's okay because I got them out of their rooms and off their devices. And it's fun when they're like, "Aw, remember when I made this?" So I'm here to say it's okay if your tree doesn't look perfect. And it's okay if it does. But imperfections have always been more interesting to me. Each of these ornaments tell a part of our story. Do you have a Pinterest tree? I can't with the pinterest trees! That is just not my thing. Our tree is full of meaningful ornaments and it's a mishmash of fun! Omg, we do not have a Pinterest tree. We have a mess of ornaments. I'll post it soon! We do have a live tree because we live in the arctic tundra. But when you live in the south, you do not get a live tree unless you want a dead tree by like December 5th, lmao. I can't with Pinterest people. The perfect gifts, the perfect tree, the perfect house. STOPPPP. Have you seen Bad Mom's Christmas?? It's a must see! I love the Bad Moms. I'm not a mom yet, but I strive to be them hahahaha. Haha, mine isn't Pinterst worthy, either. When we travel, we get ornaments from the places we go, so our tree is filled with an assortment of ornaments. My tree is filled with ornaments that hold great memories. My youngest daughter is 29 and I still have the picture ornament she made in kindergarten. And it always has it's place of honor on my tree. Those Pinterest trees put so much stress on the rest of us! I'm all about letting the kids get involved - that's part of holiday traditions! I love it. 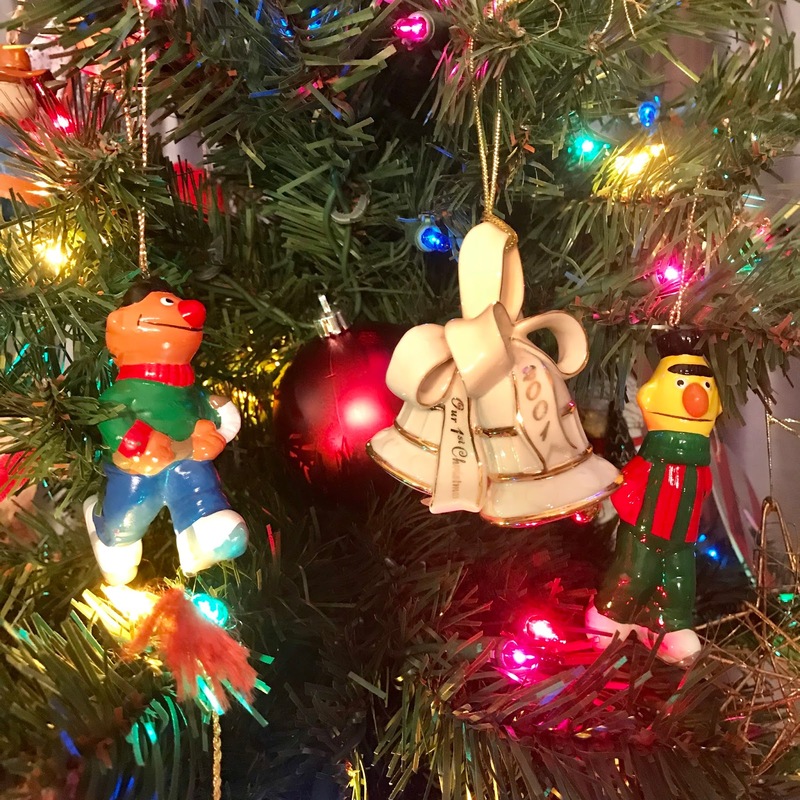 The Bert and Ernie ornaments are awesome because they remind me of the show Christmas Eve on Sesame Street which I have always loved! We don't have a Pinterest tree here either, don't even try for one. I don't do Pinterest pretty food either, I prefer real looking things. Nope. No Pinterest tree here. I do have that Chewbacca ornament on our tree though. I made the tomato cage trees to decorate our front porch. I guess I do have a Pinterest-y tree after all. I love your tree! It reminds me of ours. Full of ornaments from my own childhood, my kids ornaments they've picked out every year. 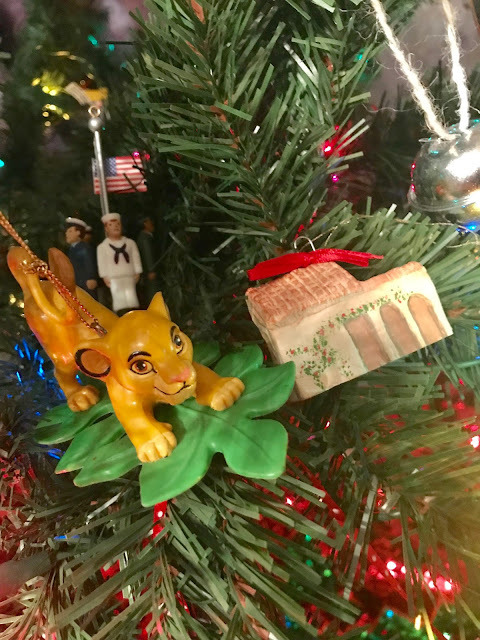 Ornaments from vacations, and ornaments that have meaning. I am not about to have a Pinterest tree. For what? Looks? To show? Nope, sorry, I'll take my family tree over one that looks like it belongs in a store front and not a home. 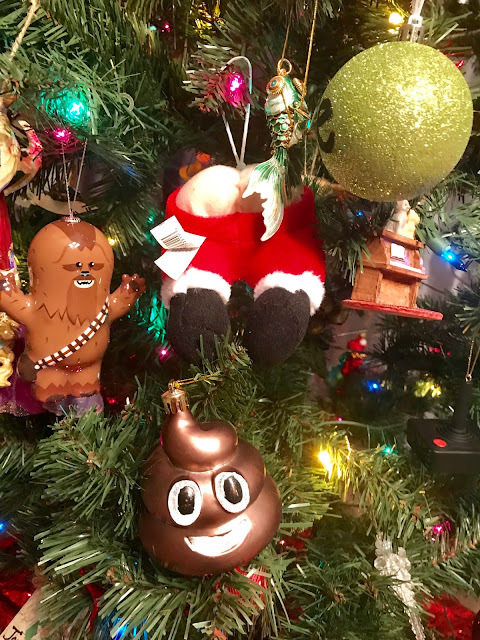 I love seeing all of your adorable ornaments! We have ornaments that have meaning as well. The perfect addition to the holidays. Each one has a memory. I love your tree! Its more fun and interesting to decorate the tree with things that brings out memories in our life! And that cotton tige DIY is just so funny! We don't have a Pinterest-worthy tree too. We have ornaments that we have had since 25 years ago! Every year my mom gets a special one and it earns a spot on the tree. Setting it up and hanging decorations are a family tradition. We always put up our tree one week before the first Sunday of Advent. Yes! We ditched the breakable ones when our first was born. I already clean up after three kids, why would I want to add cleaning up after a fallen tree and broken objects too! 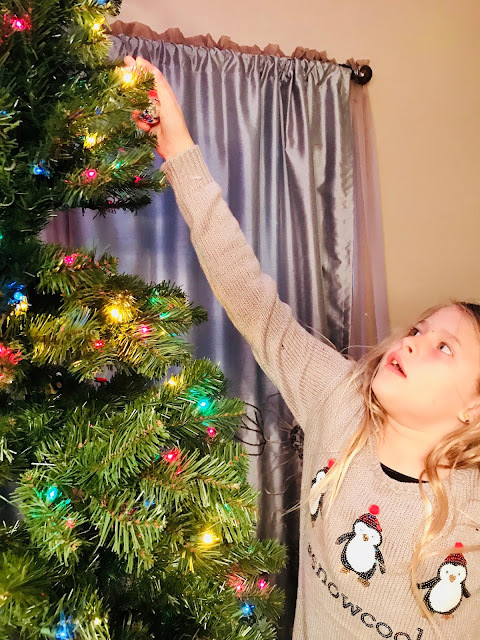 When it comes to children and Christmas trees, imperfection is perfection! Our homes do not have to Pinterest perfect. Eclectic assortments are therefore favored over ritualistic meaningless perfection.The attainment of"Perfection is realized in the process and attendant meaning it brings to you and your family. Love your tree! It reminds me of my Christmas tree growing up. So many wonderful memories. I don't have a Pinterest tree though. I love that your tree is filled with ornaments that bring back memories and have special meaning. Our tree is not coordinated or Pinterest material either. We have a lot of ornaments made by the kids when they where little and that is what makes our tree special. Our Christmas tree isn't Pinterest perfect, either. I love the fact that it is filled with homemade decorations and ornaments from our travels. Our tree tells our story. Pinterest trees can sometimes be boring. I love that your tree has special ornaments and memories from your past. It's beautiful. We have a pretty large collection of random meaningful ornaments too. They weigh down the branches and look a little messy sometimes but I love them! It looks like a pinterest tree to me seriously and I think that's the whole point, the kids are suppose to help. My kids help in my house too, even my 22 month old helps out and that is the fun and beauty of Christmas! I love your tree topper. I think the lights look great. I always get the kids involved in decorating the tree. I like to do it different every year. We too have no Pinterest Tree, I feel more happy when my son messes up the tree the way he wants to and shouts out, yay, its decorated. Its not at all matching and coordinated for sure. And I'm happy to see his enthusiasm. Pinterest trees are really pretty to look at, but to be honest, they usually lack the personality I like in a tree. The unique ornaments show a lot about people's personal interests. These are the kind of trees that I like to see! Pinterest is just a means to inspiration and should not be viewed as a way to live your life! I love your Christmas tree decorations! It looks so fun and festive! My tree is horrible, but still festive. There are no bulbs on the bottom branches thanks to our cats, and the middle is missing candy canes because that is how tall my sneaky daughter is. It's fun decorating with kids, your tree is so festive and I love the light shining from the star. What a cool way to top the tree. This is such a creative tree. I love the star. It seriously looks like a disco setting :) Moreover, the frame made with ear buds really caught my attention. Merry Christmas. Cheers!! ahahah loving the poop emoji ornament! I think christmas is whatever you make it, so what if your tree isn't picture perfect, its perfect to your family. I am very co-ordinated with my tree but because fo this I have 2 trees lol one that I have had for years before having my son and one that is all disney and he helps me to decorate. I think your tree is lovely and I love when kids get to help. In my opinion this is the best way to do it. It has so much more character, and is just so beautiful in every way. Pintetest Christmas trees are the trees i saw at various malls and its crazy and wow expensive, but no personal touch. 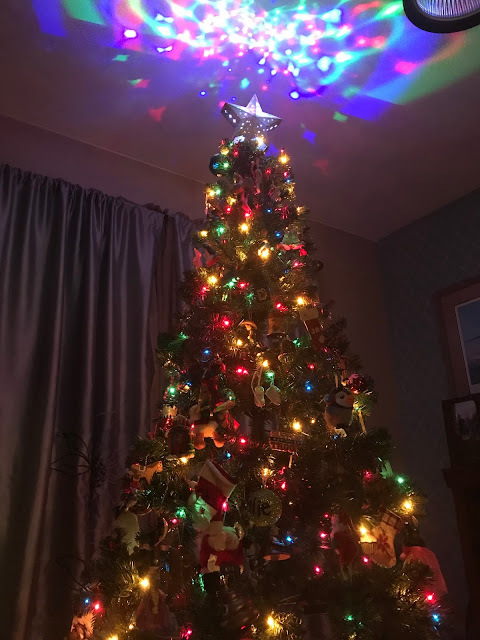 I like your Christmas tree, and super wow with your disco star! Where did she find it?! My tree is definitely not a Pinterest tree lol. It is really pretty and the kiddos had fun decorating it like they always do. Your tree is really pretty. I love your tree!! I definitely prefer having ornaments with meanings and stories behind them!! And definitely a fun time to get the kids out to decorate and do something together instead of having that Pinterest tree. Both the little ones and the big ones will love these Christmas decorating ideas for kids. They are all things children can do on their own. Right! I always wonder how people manage to have picture perfect trees. I am so excited to decorate the tree with my son next year, he is too small now. Your tree is beautiful! I don't think I do! The lights are all strung oddly. And we have the weirdest ornaments ever. And it's 18 feet tall and nearly killed us! My tree was always similar to this growing up and I really loved it. The starts is so cool! I love the disco-like thingy, very colorful and unique. I need to check that, I want to have one so I can set it up in my Christmas tree as well. I like your Christmas tree because its one of a kind, personalized and not dictated by what's the trend. All original comes from the heart of your family. I use to love having a themed tree until my husband convinced me to try a real tree with all kinds of ornaments. Now I'm in love with out family tree! Your tree is lovely! I am obsessed with that star - what a cute look and I love the fun lights. Liking your eclectic tree a lot! 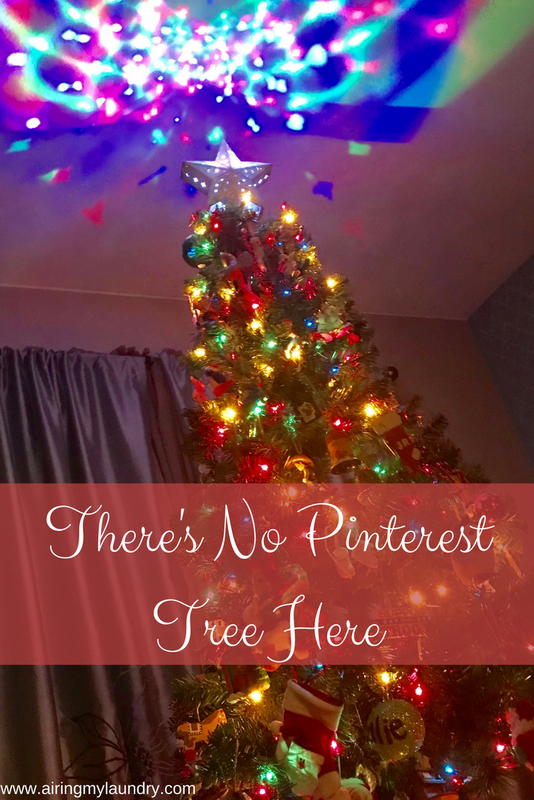 Does anyone really do a pinterest tree? 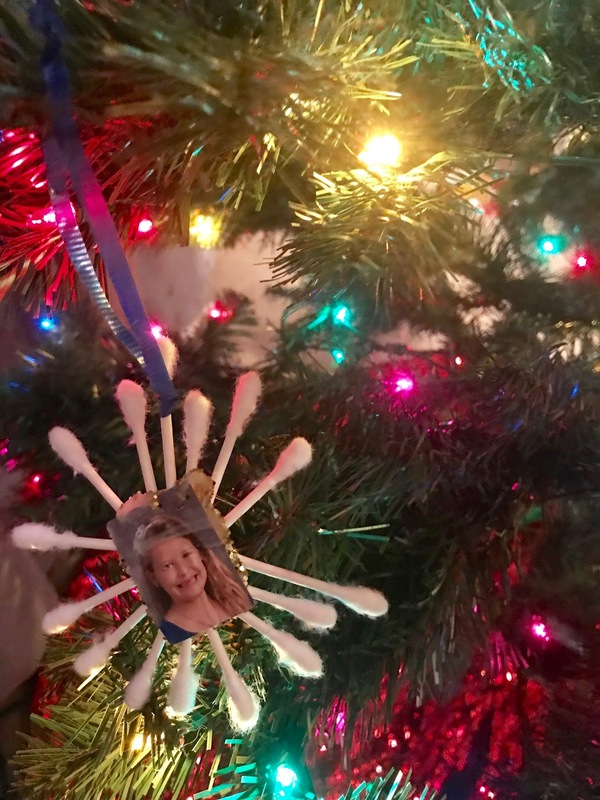 Our tree has so many handmade kids ornaments from school with their pictures on them. Things we have collected on trips, our tree is a family tree. This is exactly what I LOVE! My tree is never perfect and honestly I don't want it to be! I want my kids to decorate it how they like it! It is more creative than anything I have seen in Pinterest! My main tree has always been an assortment of ornaments including ones the kids made for me when they were in kindergarten. They are now grown! I do have a tree that is color coordinated for the decorator in me but the family tree will always be my favorite. We do not have one either. Ours is a hodge podge of ornaments that the kids put up. One of our kids rearranges the ornaments every night before bed. My Christmas tree growing up was no Pinterest tree but I surely remember it! Not so much each year, but the tree itself and how much we loved decorating it. I absolutely love your tree! I don't have a Pinterest tree either! I love my eclectic tree with a mix of ornaments old and new.. to me it is more meaningful! Your tree is beautiful I still have no Idea where I threw mine when we moved and I am not in a hurry maybe this weekend I will try and find it. My tree is decorated with lots of love from the Star Wars ornaments to the handmade ones the kids have made at school and more. It's beautiful to me and my family and that's all that counts. I love having a tree that has meanings to the family it belongs too. Ornaments kept from childhood like your Symba one are so special! You have a beautiful tree I love how your ornaments have significant value. It makes more special we i love the lights on the ceiling. My son, daughter, and two year old granddaughter decorated the tree for us this year. It definitely is not Pinterest worthy. Our Christmas tree is a bit wacky, but it is full of memories and I wouldn't want it any other way! Not sure that my tree would be considered a Pinterest tree... Love the way that your tree turned out though. Love this! My tree is definitely not Pinterest-worthy, either. No big circle of garland or ribbon, also because of the cats. I have a mix of ornaments, some that are as old as I am! We're talking full-on 70s vibe, lol. I love my tree so much and wouldn't change it for all the Pinterest-worthy trees in the world. We do not have a Pinterest tree either! I let the kids decorate the tree. It's about having fun and making memories, not trying to create a show piece, at least in our home. Maybe some day when the kids have moved out, but I love our tree just like you love yours, because of all those special memories. Pintrest Tree or not, I love your tree! I love how it has memories associated with the ornaments and that the kids got to help! What an wonderful Christmas tree you have! Full of beautiful family memories! This is the real tree! The Pinterest trees look so prim and proer,but lack the human element. It is always fun with the kids doing the decoration. The tree some have seems to have more heart then. Your tree is very beautiful! Looks like you have a lot of great ornaments with some memories. We do that as well. I always hang those ones each year. They're so special. Such cool full of fun and joy tree! Great job! Oh I LOVE your tree!! Full of bright colours and special memories and traditions. I just love it! We have one tree which I do myself and one which the kids do which is a mish mash of wonderfulness! I love the classic Christmas trees like yours! Not everything has to be done from Pinterest. ;) Love the unique ornaments that you have! I love how honest and open you are. Either way is fine but, I am glad you make your tree uniquely yours. It's beautiful btw. I've been doing fake trees to for a few years. Less mess! We have one coordinated fancy tree and one kids tree. Both beautiful. This is a great one. I don't have a tree at all but I do enjoy looking at ones from other people as they do tell a story or two. Thanks for sharing. I agree with you my Christmas tree is not Pinterest worthy, still it has memories attach to it. Kids love decorate with ornaments which they made. You got cool decors for your Christmas tree!! Haha the emoji decor is a cute addition!! Loving it. Yay!! I guess your kid was so happy to get the star this time! The best tree is the ones that is filled with precious memories and love. 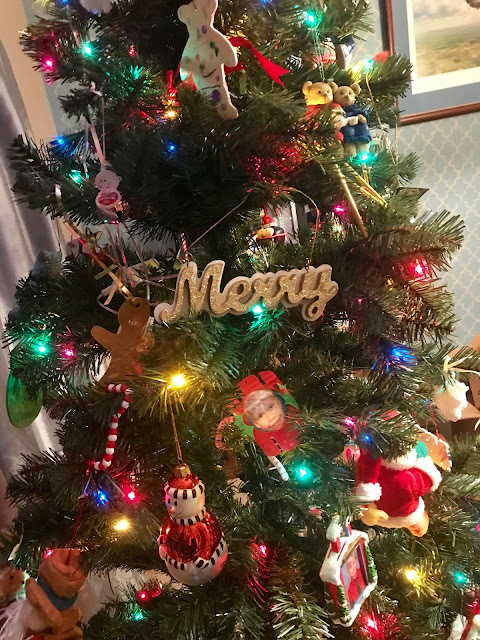 I love that you added ornaments from your childhood to the tree!